where is standard Brownian motion (or the Wiener process) and is a twice-differentiable function. The first term is recognizable from the chain rule in classical calculus, but why the second term? If is truly infinitesimal, it doesn’t even seem possible that . To understand Ito’s lemma intuitively, think of as a little stochastic variable, specifying ‘s change during the next . This models Brownian motion (or the Wiener process) completely. Now should be a little stochastic variable too, modeling the stochastic process . The picture at the start considers an example where , thereby suppressing the “intuitive” or classical term in Ito’s lemma. The reason why in that picture is the reason why that “non-intuitive” term is needed. Why doesn’t dominate away (i.e. )? Because does not come from as happens with classical differentials. 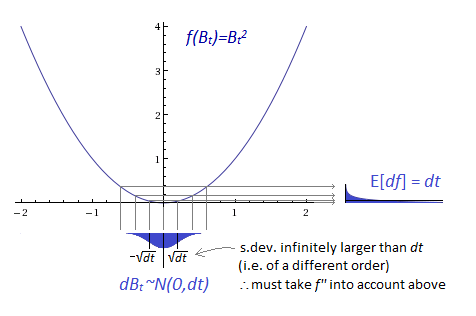 The strong law of large numbers implies that a stochastic differential’s expected value pushes its integral on a faster order than its deviation does. Hey super cool content here! Is there any way from someone that has knowledge of calculus 3 and mathematical statistics 2 or less to understand that? I would love to share Ito’s lemma with my Financial Technology club. why is the derivative f’ in the considered example of f(B_t) = (B_t)^2 equal to zero? In that sentence we are considering only the (example) case where B_t = 0. I will clarify the text; thank you for pointing this out.